Preparation time: 10 minutes. Baking time: 20–25 minutes. Preheat oven to 400°F. Place an 8-inch cast-iron skillet in the oven to preheat. In a large bowl, stir together cornmeal, flour, baking soda, baking powder, and salt. Add egg substitute, oil, buttermilk, and water, stirring until just moistened. Using oven mitts, remove skillet from oven and coat liberally with cooking spray. (Alternatively, an 8″ x 8″ baking pan at room temperature, coated with cooking spray, can be used). 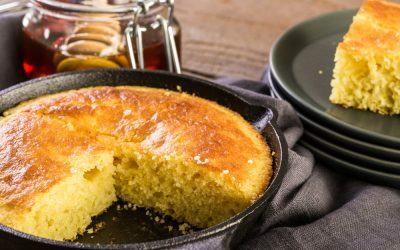 Pour batter into skillet and bake for 20–25 minutes or until cornbread is golden and cooked through. Serving size: 1/9 of recipe. Exchanges per serving: 1 1/2 starch, 1/2 fat. Carbohydrate choices: 1 1/2.